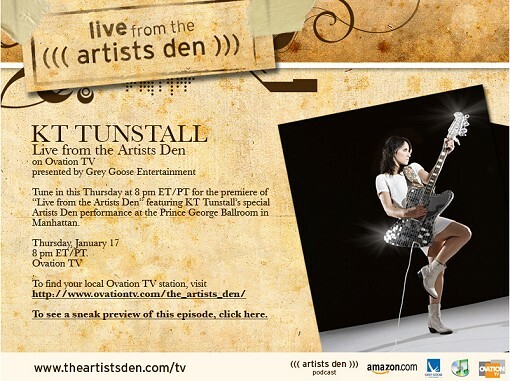 Live From The Artist’s Den is a new live music series set to debut tomorrow night (January 17) on Ovation TV. The series kicks off with a live show from KT Tunstall recorded at the Prince George Ballroom (43rd and 8th) in Manhattan. Other artists slated to appear in the series include: Crowded House, Josh Ritter, The Swell Season, Ben Harper, Fountains of Wayne, Patty Griffin and a secret artist. From the podcast series, I also know the following artists have also appeared at The Artist’s Den: Regina Spektor, Joseph Arthur, Greg Laswell, Ben Kweller, The Cloud Room, Martha Wainwright, and The Cary Brothers.